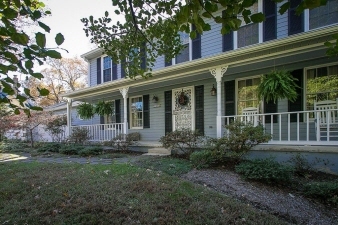 -A great country feel yet you are less than 5 minutes to many amenities and 10 minutes to St. Charles Town Center and less than 30 minutes to Andrews. Additional Features and Amenities Welcome to this rare beauty in Sentry Woods on a half acre lot! This traditional interior center hall Colonial with a formal living and dining room has a spectacular layout and has been updated along the way. You will love all the extra space it provides such as the large finished basement with rec-room with a half bathroom and storage. On the main level, enjoy views of the gorgeous treed back yard and lush landscaping from the kitchen, breakfast room, and family room combo. Upstairs the four spacious bedrooms have room for everyone and each has plenty of closet space. The entertainment possibilities don't stop inside - enjoy plenty of room to entertain on the back deck and the front porch. The extended 2-car garage is perfect for all your projects. This home has a great country feel yet you are less than five minutes to many amenities and 10 minutes to St. Charles Town Center and less than 30 minutes to Andrews. Hurry, this one will not last!